A major feature of Elementor 2.1 is the ability to work with Custom Post Types (CPT) to make templates for displaying the data from CPT fields. To review the lay of the land, WordPress has long had support for custom fields and custom post types, but a WTF is that displaying this data was not straightforward. Toolset Views has been a go-to tool for developing custom queries and displaying custom data, but has not been the easiest to use. When the Beaver Builder team released Beaver Themer then a drag and drop builder solution became available. There are two caveats with a Beaver Themer approach. First, the rules and conditions were limited when compared with Toolset. Toolset covers a lot of edge cases. The forthcoming update to Beaver Themer addresses many of these concerns. Second, Beaver Themer is an add-on product to Beaver Builder and that means an additional subscription cost. Elementor, however, is bundling in the “themer” functionality with the Pro version, which generated a lot of excitement. In March, when the beta for Elementor 2.0 was released without Toolset support there was word that it would be coming in May. It is now July and the first Elementor Pro beta with Toolset support was just released. It’s hard to know what happened. The Toolset team was neck deep in an already overdue post relationship project. May, as you might recall, was the original target for Gutenberg. 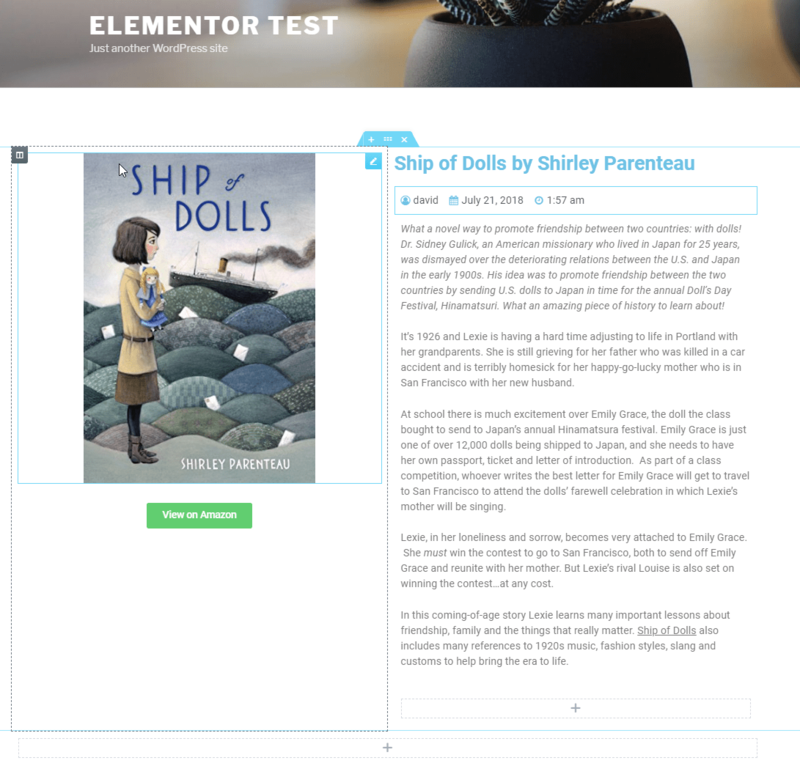 The Elementor team rolled out a series of updates after the initial 2.0 release. People interested in the integration have been waiting. Now, Toolset has added initial support for an Elementor integration and a beta of Elementor 2.1 with Toolset integration is now available. Note that there is additional information in the article below the video. I setup a test site with Elementor Pro v2.1.0-RC1, the latest versions of Toolset Types and Views, and the Twenty Seventeen theme. I created a custom post type “Books,” with some custom fields, and added a couple of records. 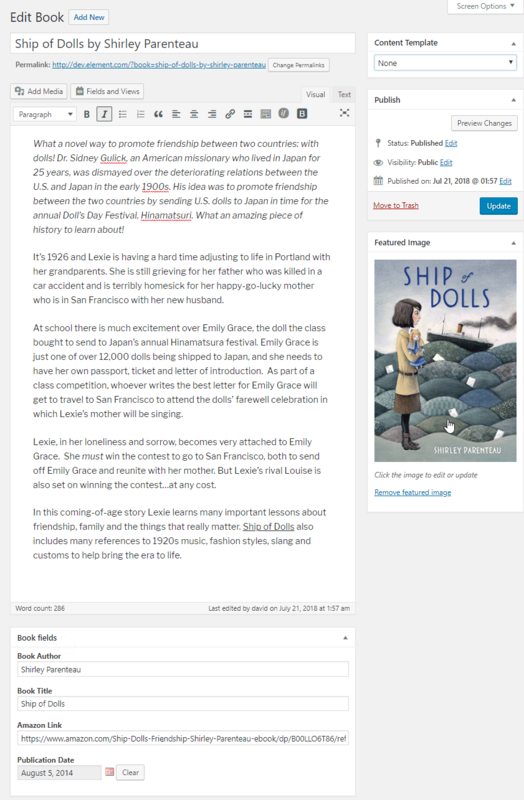 Here is a screen shot of one, with the custom “book” fields below the post content. 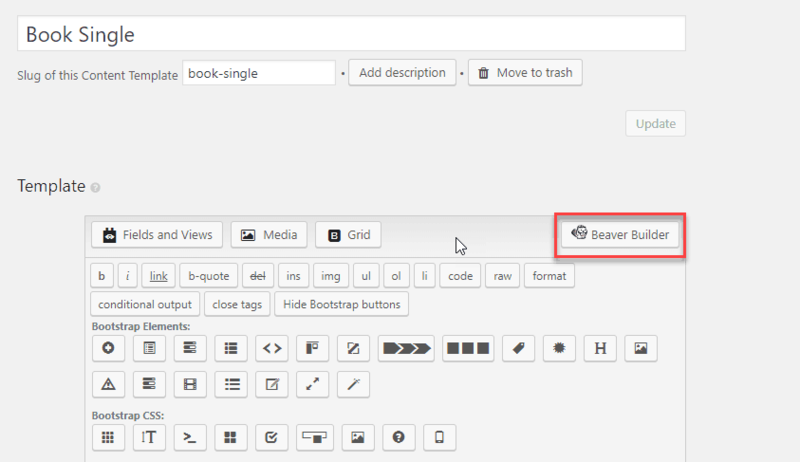 The button provides the option to use Beaver Builder to layout the content template instead of doing so manually in the code editor. Unfortunately, this option is not available in the current beta. The Toolset and Elementor teams were very helpful as I was exploring this. They told me that for the time being, at least, the idea is that we use Elementor to create the content templates. So, I went into the Elementor Templates builder and gave it a try. I started with the Single Template for Books. The instructions were to use the post type field widgets for the custom post type. I dragged and dropped these into the page for the “traditional” parts of the post. For the custom fields, I used the dynamic data connectors. These appear where ever it makes sense for the insertion of dynamic data from the customer post type. I was glad to see the inclusion of the Toolset fields in the list of dynamic options. Here is a screenshot of a simple layout I made in about 2 minutes. Notice the button to Amazon has a link from one of the custom fields. I next tried creating an archive page for “Books.” This was also straightforward, using the archive widgets. One thing I noticed with the archive template is that there is not as much flexibility as with the single template because one is limited to the archive widgets available. I didn’t see any dynamic data options on the Archive Posts Widget itself. I tried using regular widgets for the archive, but that didn’t work. In addition to the ability to create content templates and archive layouts for custom post types, in this beta there is also a Views widget. This widget allows you to insert Views into the posts and pages built with Elementor and is a nice feature. I was struck by how easy and fast it was to create the single and archive templates. This entire process was very quick and straight forward. Though it could be a subjective impression, it seemed like this was faster and easier than using Beaver Themer. 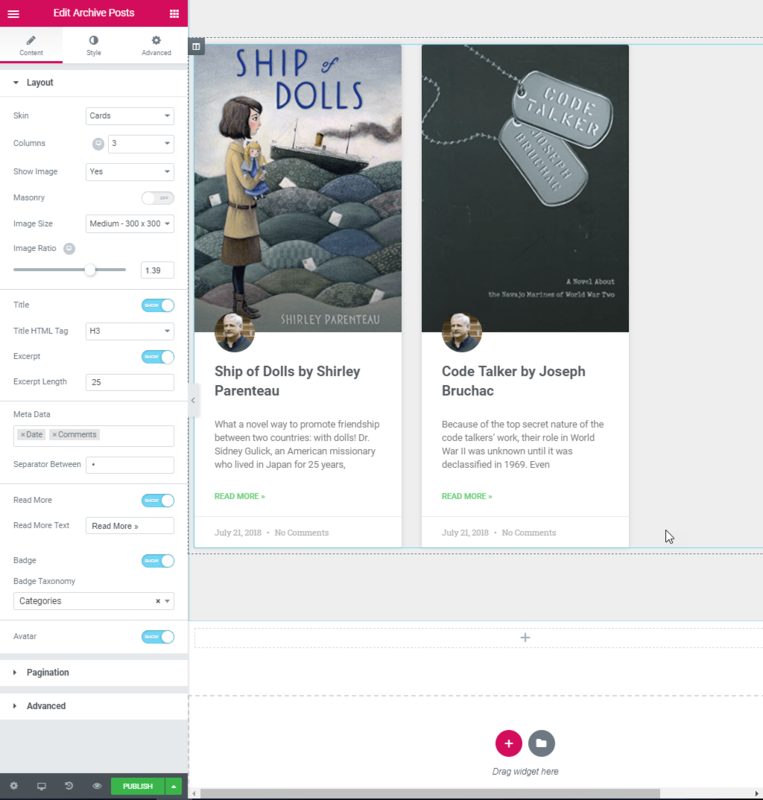 Creating content templates for the single Book seemed well thought out and flexible. For the archive pages there might not be all of the options needed, especially if you wan to include custom fields in the archive layout. One thing I wanted to note was that while testing the beta, the Toolset and Elementor teams were very helpful in answering my questions and providing information. It is good to see the two companies working together for the benefit of the customer. The Toolset team mentioned that there are some additional integrations coming, but there were no details. All in all, the beta is a solid first version that covers most of the basics. As the companies get further feedback from users they will no doubt continue to build on this foundation. Because the process was so quick and easy, I’m hoping that the Elementor and Toolset integration develops into a robust and full featured option that we can turn to for even complex solutions.